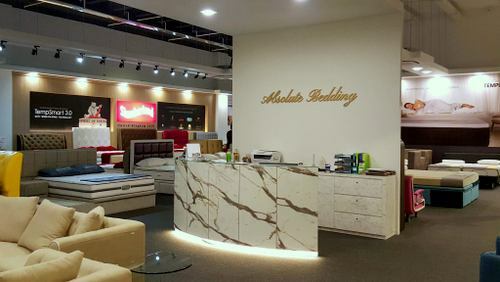 Mattress and furniture store Absolute Bedding has three stores in Singapore, including one within Century Square shopping centre (2 Tampines Central 5). Visiting one of the Absolute Bedding showroom stores, you’ll discover a huge selection of mattresses, beds, sofa sets, modern bed frame designs, and furniture for living & dining rooms. In addition, you can also purchase from a range of leather and fabric sofas that have been imported from Europe and elsewhere in Asia. Overall, for living rooms, you can shop for carpets & rugs, leather sofas, fabric sofas, lounge chairs, ottomans & stools, and other chairs. For dining rooms & bars, the showroom stores have dining tables, dining chairs, bar stools, TV consoles, coffee tables, side consoles, shoe cabinets. Purchasing furniture for a bedroom, Absolute Bedding has bedframes, pillows & mattress protectors, chest of drawers, storage-beds, wardrobes, plus sidetables. In terms of lighting, you can purchase chandeliers, table lamps, and floor lamps. Finally, the shops’ mattress selection includes such brands as Gainsville, Simmons, Slumberland, TEMPUR, Vazzo, Sealy, Vono, Princebed, MAXCOIL, Dunlopillo, as well as mylatex. The official Absolute Bedding Facebook brand page is located at www.facebook.com/absolutebedding/. Following the Facebook page, you’ll learn more about the available range of furniture and mattresses at the stores, Absolute Bedding’s promotional offers, their events, plus more.